Kids Crafts: Where Creativity Never Ends. Kids crafts are a perfect way to keep the young ones occupied while also helping to spur their creativity and imagination on. Kids as a group are a creative bunch. Their minds are wellsprings of ideas and all they need are the tools and materials to make those ideas into something concrete. That’s where you come in. It’s a wonderful way to expose them to new mediums and maybe get them started with a new hobby. Childrens arts and crafts also provide terrific diversion for when it’s a dreary, rainy day or school’s out. All you need to do is provide the basic supplies. That’s it. By project’s end, the kids will have taken care of the rest. Chances are each one will have found a new way to express themselves individually. A pack of toothpicks can turn into tiny building blocks; a hair barrette can be transformed into a stamping imprint. Just stand back and wait to be dazzled. As for craft projects, how about these? Use a pair of socks or if making one from scratch, felt and glue work well together. Help young kids with any/all adhesives and monitor the use of tiny materials, such as eyelets or buttons. Much like scrapbooking, a collage is a themed collection of smaller parts to make a whole. Old magazines are great for cutting up – for images, color/contrast, and spelling out words. A terrific craft project for older kids; a box of beads, charms, and string can keep a group occupied for hours. They can either wear their creations or cut the string to start again. Making this pliable building material is only half the fun; once it’s “ready,” it’ll be time to create. Keep food coloring on hand to add a splash or blend. These can be made out of construction paper, felt, or cardboard. 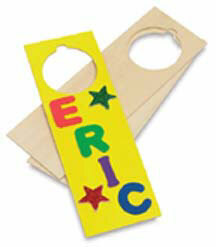 Dress them up with any embellishment you like and make them stand out, like a party favor. If it’s the holidays, it might be the perfect time to create some favors for guests. Get the kids involved by giving them a project to work on, like creating candy bundles, and then given them the freedom to decorate. The springtime is a time of renewal and kids not only like to spend time in the garden, but they also enjoy beautifying it. Let them paint flower pots before the season’s perennials are planted. Some basics you might want to keep around the house for spontaneous kids crafts include construction paper, colored paper, art pens, organic glue, glitter, safety scissors, pipe cleaners, buttons, eyelets, ribbon, molding clay, and washable paints. As for how to get kids started on craft projects, it’s not a bad idea to come up with a project list beforehand. Then, when the time comes to really work on kids crafts, you won’t waste time brainstorming or getting supplies. Keep a box of materials and tools handy and when energy gets low, inject it with some crafty fun!